Secretary-General Ban Ki-moon today voiced his profound sadness at the loss of life and destruction caused by the accidental explosion of an ammunition depot in the capital city of the Republic of Congo. Yesterday’s explosion in Brazzaville reportedly killed at least 200 people and wounded more than 1,000. It was so powerful, according to media reports, that its impacts were felt several miles away in Kinshasa, the capital of neighbouring Democratic Republic of Congo (DRC). Mr. Ban extended his sincere condolences to the families of the bereaved and to the Government and people of Congo as a whole, his spokesperson said in a statement. 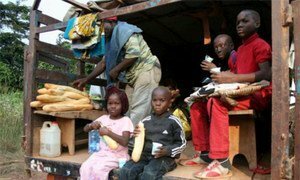 “The United Nations expresses its support to the Republic of Congo at this difficult time and reassures the authorities of its continued cooperation and assistance to ongoing humanitarian relief operations,” the statement added. The legacy of internal fighting in the Republic of the Congo over a decade ago still lingers on, with the fate of those who disappeared remaining a mystery, a United Nations human rights panel said today.